Known as the Golden State, it is hard to shake off the popular images of California that include volleyball on Venice Beach, the high-tech world of Silicon Valley, Disneyland, and the glamour of Hollywood film-star life. California is by far the most densely populated of all US states, with the majority of Californians living in such cities as Los Angeles, San Francisco, San Diego, San Jose, Fresno and Sacramento. That aside, California is a land of real contrasts. It encompasses everything from the mountains of the Sierra Nevada to the Mojave Desert. Along its western edge is the long and rather spectacular Pacific coastline, known as Big Sur. In the north are the vineyards of the Napa Valley, while in the south, giant sequoias and redwood trees dominate the natural landscape. At the lowest point of California is the aptly named Death Valley. For most of California's early history, the region has remained relatively isolated. The state's first Spanish mission only dates back as far as the 18th century. The California Gold Rush of the mid-19th century was to change all that, attracting thousands of immigrants into the area and vastly increasing the region's prosperity. 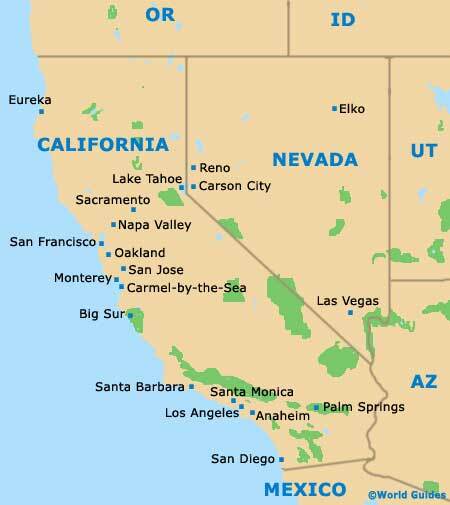 California became a US territory in 1847 and, three years later, it became the 31st US state. Throughout its history, California has experienced regular earthquakes because of its location on the San Andreas Fault. In fact, close to 40,000 tremors are recorded every year. Anaheim is a popular tourist city and stands in the Orange County area of California (CA). Near to Los Angeles, Anaheim city is best known for its scenic Orange Groves and enormous Disneyland theme park complex. Offering a stunning coastal situation, Big Sur is the ideal spot for nature lovers, being near to a total of three very noteworthy state parks. Close to Big Sur is the Andrew Molera State Park, the Santa Lucia Mountains and a number of beaches. Often going by the official name of Carmel-by-the-Sea, the Californian town of Carmel is something of a seaside resort and very Bohemian in character. Carmel lies next to the Pacific Ocean, with the beachfront Scenic Drive being worth a look. Lake Tahoe is an extremely picturesque, azure blue expanse of water, and lies between the borders of both California and Nevada. Around Lake Tahoe are a series of very different towns, with casinos being widespread on the Nevada side. Los Angeles or 'LA' is a rather complex city, with sumptuous golden beaches, near-perfect surfing conditions and numerous local movie stars. Split into a series districts, popular areas include Hollywood, Beverly Hills and Malibu Beach. Located at the edge of the spectacular Monterey Bay area, in the state of California, Monterey dates back to the 1770s. With many historic adobe buildings and a Mexican / Spanish heritage, Monterey is known for its exceptional aquarium. California's wine country of Napa Valley has become extremely famous for its many hundreds of surrounding vineyards. Those with even only the slightest interest in wine tasting and vineyard hopping will find Napa Valley a delight. Oakland is one of Western California's biggest ports and is situated in the main bay area. With an important political history, notable points of interest include the waterfront area, Jack London Square, the promenade and Chinatown district. Palm Springs is known for its many spring breakers, who arrive to enjoy the legendary Californian sunshine and city attractions. With a Spanish and European flavor, Palm Springs features a large selection of golf courses and resorts. Sacramento, capitol of California (CA), was founded in 1839 and contains a rich, gold rush history. The city has evolved greatly over recent years and features two large universities, a busy riverfront area and notable jazz nightspots. San Diego, one of the most important cities in California, is known for its stunning beaches, natural harbor areas and particularly historical buildings. With many outdoor activities, top attractions include San Diego Zoo and SeaWorld. San Francisco in California is a spectacular peninsula that is surrounded by water on three sides and grows from the inside out. This modern city is visually spectacular, with many world-famous steep hills and views of San Francisco Bay. San Jose city is the capital of Silicon Valley, standing in the sunshine state of California. The city boasts a number of impressive statistics and is largest city in northern California, averaging more than 300 days of sunshine each year. The city of Santa Barbara is located in the sunny state of California, alongside the Pacific Ocean. Santa Barbara is home to many major sandy beaches, together with restaurants, shops and museums in the busy State Street area. The coastal resort of Santa Monica stands in California's Los Angeles area and has long been a major tourist destination, actively promoting tourism. Santa Monica features a historic pier, sandy beaches and many notable areas.